Moving to a new location can be fun and exciting. I love learning about different cultures, trying new foods, and seeing new scenery. But there are downsides to starting over in a new place and one of those is losing things that were familiar. A visit to the market can take longer since you may not find the brands you know and a new doctor and dentist you're comfortable with can also take a while. When I moved from New Mexico to New Orleans I left behind a lot, including some of my favorite places to grab a meal. Luckily, I love to cook and I don't mind experimenting until I find a way to create my own version of a long-lost favorite. 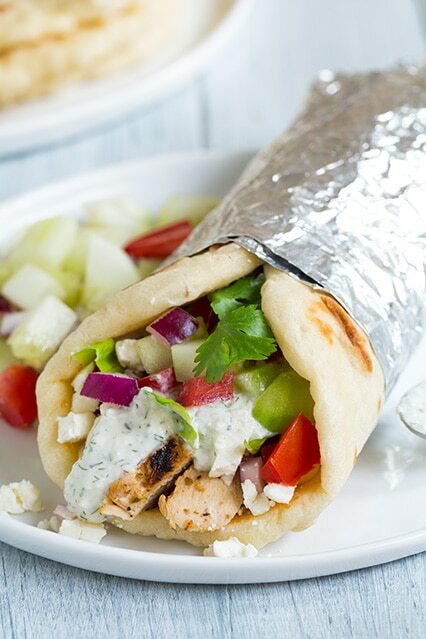 One of my favorite comfort foods was the chicken gyro from a local Greek restaurant. I've searched for a suitable replacement, and while I've found a lot of really good versions in my new area, I haven't yet found one that tastes exactly like the one I crave. That craving has been growing more and more intense, so I decided to stop looking and just make it for myself. While clicking around on the Internet one day I found this recipe for Chicken Soulvaki on a site called Cooking Classy. The chicken turned out exactly like the version I'd been craving. Serve with thick-cut fries and you have one of my favorite treats. In a mixing bowl, whisk together olive oil, lemon juice, Greek yogurt, red wine vinegar, chopped red onion, garlic, oregano, thyme, coriander and season with salt and freshly ground black pepper to taste. Place chicken in a gallon ziploc bag, pour marinade over chicken, seal bag while pressing out excess air and transfer to refrigerator to marinate 2 - 4 hours. Remove chicken during the last 30 minutes of marinating to rest at room temperature before grilling (leave in marinade). Brush grill grates lightly with oil and preheat grill over moderately high heat. Once hot, add chicken and grill until cooked through (internal temperature should register 165 degrees on an instant read thermometer), rotating once halfway through cooking. Remove from grill transfer to plate and brush chicken lightly with olive oil then cover with foil and allow to rest 10 minutes. Dice into strips. Layer chicken in a row along center of pita, top with lettuce, tomatoes, cucumbers, Kalamata olives, red onion, feta, cilantro and tzatziki sauce. Wrap and serve. Rinse cucumbers and place over several layers of paper towels. Squeeze some of the liquid from cucumbers (almost as if wringing moisture from a cloth). Place cucumbers in food processor and pulse to chop to desired size. Add in Greek yogurt, garlic, lemon juice, olive oil, red wine vinegar, parlsey, and dill and season with salt and pepper to taste. Plus to blend (or if you want it chunky you can simply stir the other ingredients in using a bowl and spoon so the cucumbers are chopped up more). Store in refrigerator in an airtight container up to 3 days. In the bowl of an electric stand mixer, whisk together yeast, sugar and warm water until yeast has dissolved then let rest 5 minutes. Add in warm milk, olive oil, salt and 1 1/2 cups bread flour and fit mixer with whisk attachment and blend mixture until well combined. Switch attachment to hook attachment, add in remaining 1 1/2 cups flour and knead mixture on low speed until blended, then increase to medium-low and allow to knead about 5 minutes longer until smooth an elastic (dough should not stick to sides of the bowl, so add more flour if necessary). Transfer dough to bowl lightly coated with oil, cover with a damp towel and allow to rest in a warm place until double in size, about 1 1/2 hours. Press dough down and divide dough into 6 - 8 equal portions. Working with one piece at a time, roll dough out into a round (I made 6 large 8-inch pitas) on a lightly floured surface. Heat a large non-stick skillet slightly over medium heat. Once hot, add flatbread and cook until bubbles begin to appear on surface and bottom is golden brown, then flip and cook opposite side until golden brown. Transfer to a large plate, cover with foil leaving a small opening for excess moisture to escape. Repeat process with remaining flatbread. Store in an airtight container (best served day prepared. I'd rewarm mine wrapped in damp paper towels in the microwave).